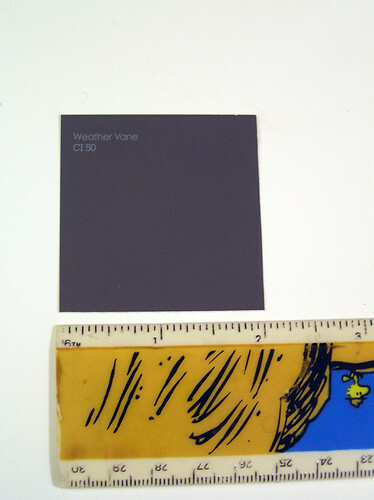 So I came up with the idea of making a color swatch board. 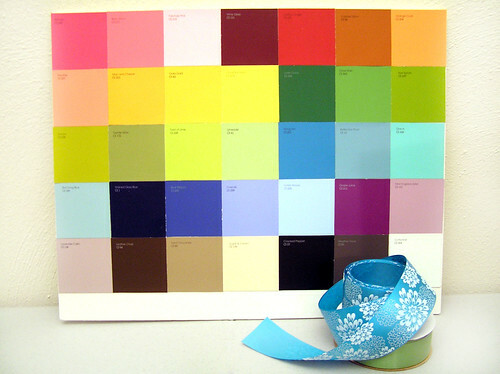 I got my inspiration from the 2011 Color Trends from A Wedding Sketchbook by Michelle Mospens. I liked the layout and simplicity. 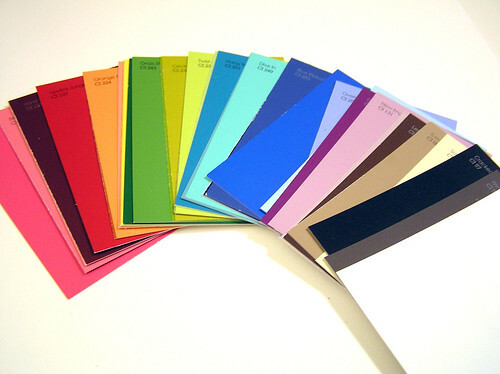 If you want to make a color swatch board, here’s what you need! 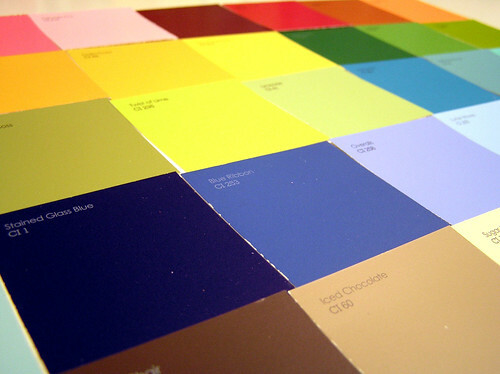 First gather your paint chips and arrange them in the order you want them to appear on the board. Depending on how many colors you want on your board, you have to do a little math and measuring to figure out how to fit them on. I had 35 different colors. I divided my board into 10X14, as the extra inch wasn’t needed. Trim each paint chip to be 2 inches square with a paper trimmer or scissors, giving 5 rows of 7 chips. 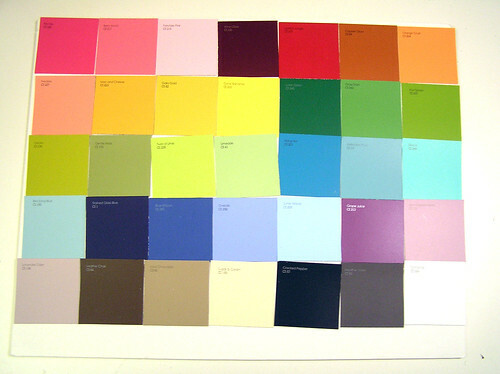 Once you have all of the paint chips trimmed, arrange them on your board how you would like the colors to flow. You can go from darkest to lightest, or in color order. I went in color order, from darkest to lightest. Next, remove the paint chips from the board, making sure to keep them in the order you want them to appear. Apply glue or double sided tape to the back of each paint chip. Then apply to your board, starting from the upper left corner. Make sure and line up both edges of your chip with the edges of the board to make it straight. Continue your rows until all chips are applied. There will be a 1 inch strip of foam core board left at the bottom that you can trim off if you want. If you make one, I’d love to see your results. Happy Crafting! 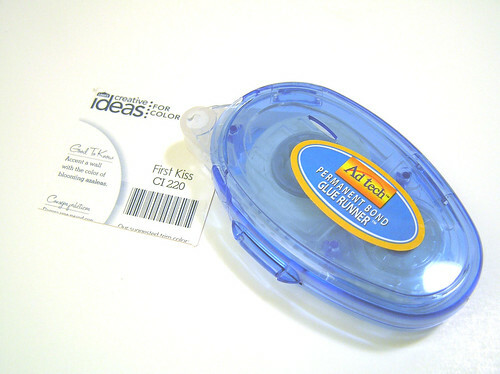 That’s a great idea. I may try to translate that for my craft stuff. Thanks for sharing! Printable Owl Crafts… on Fun with Paper! Printable Owl Toy |… on Fun with Paper! enamor · handpainted and handmade with love!